The best way to get around for you and your family is to hop on a bike, and see the town from a different perspective than the seat of your RV. 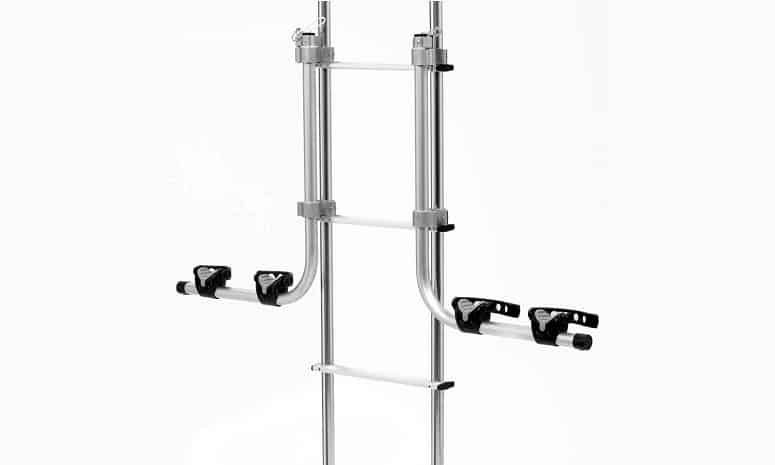 We’re here to discuss the top five bike racks, mounting, securing, weight capacities and more. This is your one-stop ultimate resource for bike racks for your RV. How Many Bikes Can Fit On An RV Bike Rack? Starting things off, Swagman comes at us with a high-quality steel bike rack, equipped to handle up to two bicycles at 35 lbs each. If you’re taking a smaller camper with you and your son, this is the perfect way to mount two bikes with little hassle. Installation is simple, and it comes with a bumper adapter which can fit up to a 2” steel-welded bumper. The price is attractive, but that comes with a slight disappointment. You’re not getting a locking pin for your hitch (if you decide to do a hitch mount), nor the security cable that most other models come with. While you can purchase those separately, it’s still a bit of a let-down. Swagman makes up for it with a compact size and durable construction. When you use the adapter, you’ll receive little to no turbulence when you’re barreling down the highway. Stromberg Carlson was a close second. You have a lot more of an involved installation with this model, which may take anywhere from twenty-five minutes upwards of forty. That wouldn’t be much of an issue, but there have been frequent customer reports of receiving incorrect hardware when the package arrives. The manufacturer is quick to fix the problem, but it is still an issue nonetheless. When you build it properly, it’s very simple to install. You’ll receive little to no turbulence on the road up to speeds of about 65 MPH. The bikes rest close to the rear window on most RVs, so proceed with caution. The main reason Stromberg Carlson caught our eye was the lightweight construction, keeping your overall haul nice and light. While the price is the top of what we would pay for this bike rack, it gets the job done, and stands the test of time thanks to the steel construction and aluminum components. 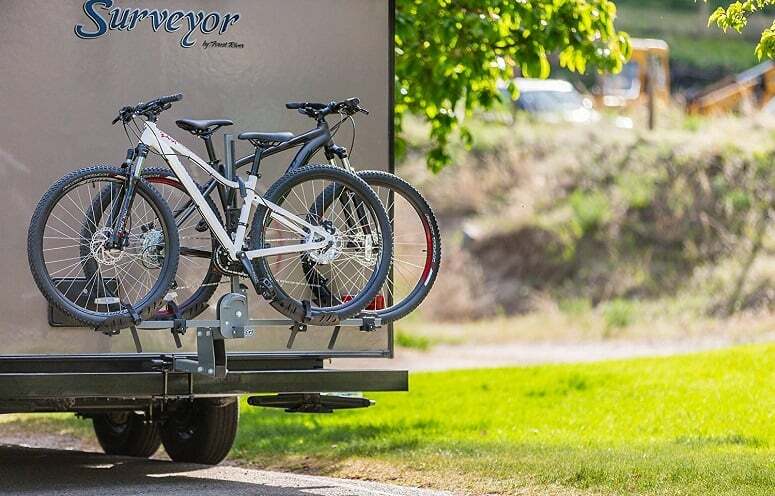 This Swagman RV bike rack is designed to make life a little bit easier, and with the right RVer to install it, that’s a possibility. The grips work stupendously, and hold onto your bikes without budging at all. The main problem comes down to driving on the highway. While most other racks will will be okay up until a certain speed, the Swagman ladder rack needs to be mounted a bit tighter. The easy installation and lightweight construction are excellent, but don’t do well under immense wind or high-pressure situations. You’ll need to bolt this to your RV. You get up to 70 lbs (35 on each side) for two bikes, and the backing of Swagman’s limited lifetime warranty if you endure any problems along the way. 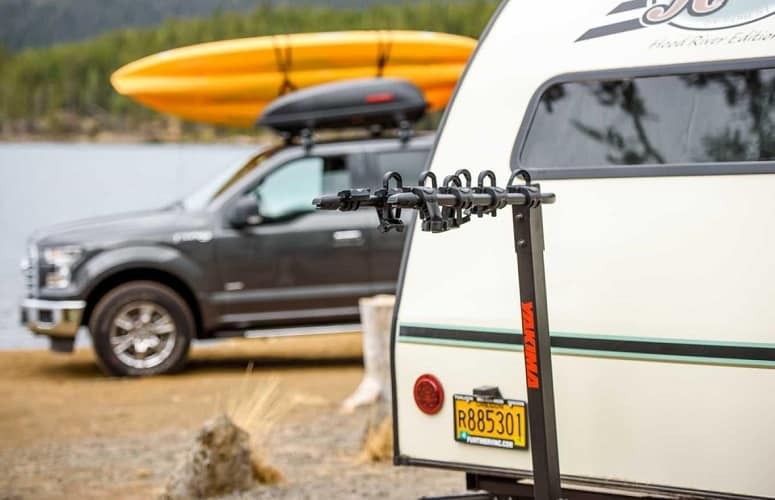 This brand likes to keep it inexpensive as can be, and for a quick fix, this is one of the best Swagman bike racks for RV users. The Swagman 4 bike RV bumper rack redefines what is possible. As the largest capacity on this list, Swagman had to put their heads together and find an effective solution for large families with more than two bikes. We believe they did it right. This is extremely quick to install and comes mostly assembled, so you won’t fumble around. Each bike can be up to 30 lbs, but if you’re planning on transporting mostly adult-sized bikes (29” wheels and above), you will run into a problem. The spots are tight, so you may only be able to store three bikes comfortably. Because of this, we don’t recommend using it with a fifth wheel or pop-up. Stability is a major upgrade from previous Swagman products. You can cruise up to 70 MPH, and because this is technically two racks working together, you’ll receive little to no rattle. This is one of the best values if you’re looking to pack more than two bikes on your next RV trip. 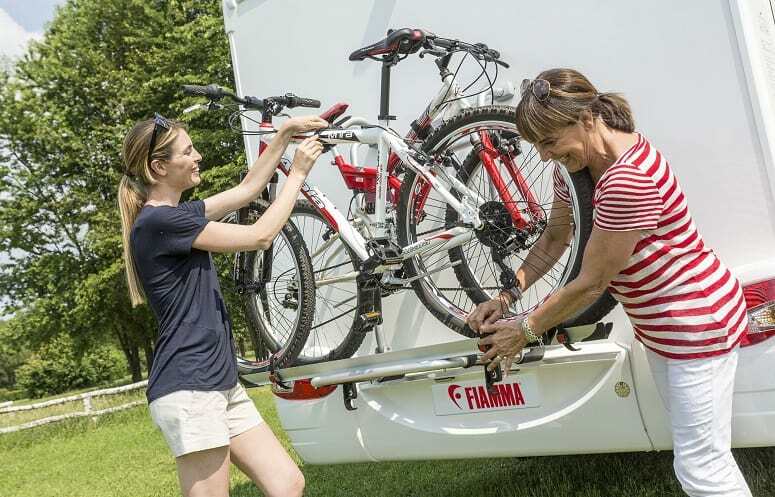 The Camco RV bike rack is a solid choice for the budget-conscious RVer. Built from aluminum and equipped with powerful bicycle grips, this rack is inexpensive, but it’s for a reason. Due to the construction, it bows a bit when you load it up. That being said, the maximum load capacity is also the lowest on our list: 60 lbs between the two bikes. You can easily drop this on the ladder, and it fits many bumper sizes, but it’s not going to be that easy to install. Because it’s intended to fit most RV sizes, you’ll have to mount additional brackets or welt it to your RV to get it to stay securely. 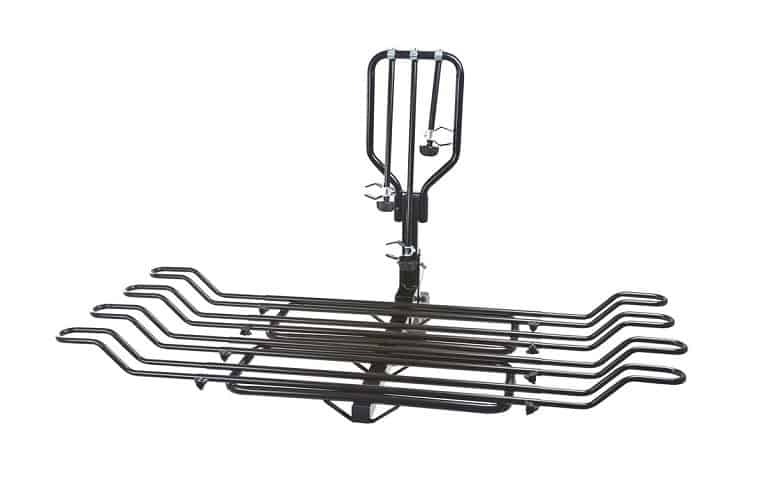 The main benefit to this is the low cost, if you can use some DIY knowledge to make this RV bike rack work better for your specific RV. This does work on fifth wheels and pop-ups, and as long as you don’t overload it, it should last you through a few seasons before wear and tear get the best of it. The beautiful thing about RVing is that you decide what time Summer is. Travel down south in the dead of November to enjoy the low 70-degree weather, or hit the West Coast for a comfortable, snow-free time. There’s just one thing missing: your bicycles. Regardless of the weather, you can travel anywhere you like and enjoy your bicycle when you get there. Apart from compiling our elite list of the best RV bike racks, we’ve also disclosed how to install them, maintain them, and what you should be looking for. Maximizing Storage Space: If you’ve previously held the bikes in the bedroom or standing up in the kitchen, then you know how aggravating it can be for your passengers. Nobody needs it falling on the floor, scratching it up, and damaging the handlebars in the process. Prevent Damages: To your RV interior, and to your bike. When your bike is rattling around in the back, it knocks into things, scratches paint, and chips countertops. Relaxation: Yes, riding your bicycle is technically exercise, but it’s also relaxing. Being cooped up in the RV can take its toll on you, so now there are no excuses for leaving your bike behind. You get a more intimate view into the areas you’re travelling. Most of the reasons are damage-related. Damage to your interior, damage to the bike. It also becomes a major inconvenience for you passengers to move around them and ensure they’re secured. For safety purposes, a bike rack is a must for long distance travel with passengers. These hook onto the rings of your ladder for quick installations, though they sometimes require a bit more work. Since no two RV ladders are built the same, welding or additional bracket mounts may be required to ensure stability throughout your travel. Ladder mounts are typically cheaper than bumper or hitch mounts. These hook onto your bumps, and in some cases, they’ll also have additional bars that hang underneath the bumper. Those added bars add stability, especially when you hit a bumpy road. Bumper mounts are the preferred bike rack of most full-time RVers, withstand higher speeds on the highway, but require a more timely installation process. You’ll notice we didn’t include any hitch mount bike racks in this guide. They take away the ability to use your hitch, and generally cost more, with longer installation times. Hitch mounts do offer the best stability, and allow you to withstand higher speeds on the highway. You can use trays and bungee cables to make your own custom bike rack. You’ll need to properly mount the trays and use high-quality, high elasticity cables, but you’ll also end up spending roughly the same as you would on a bike rack. The benefit of a bike rack is the maximum weight capacity and sustained speeds. We’ve outlined the average speed that each bike rack can handle in the product reviews above, but most trays are only going to hold up to 45 or 50 MPH before they rattle like crazy. That’s going to get other drivers nervous, and possibly get you pulled over for a safety hazard. The main pro over purchasing a bike rack is that DIY bike racks can take less time to install than bumper racks, but still take longer than ladder racks. If you fancy yourself competent to mount these off-the-cuff, you can use a tray rack for short distance travel with no problem. 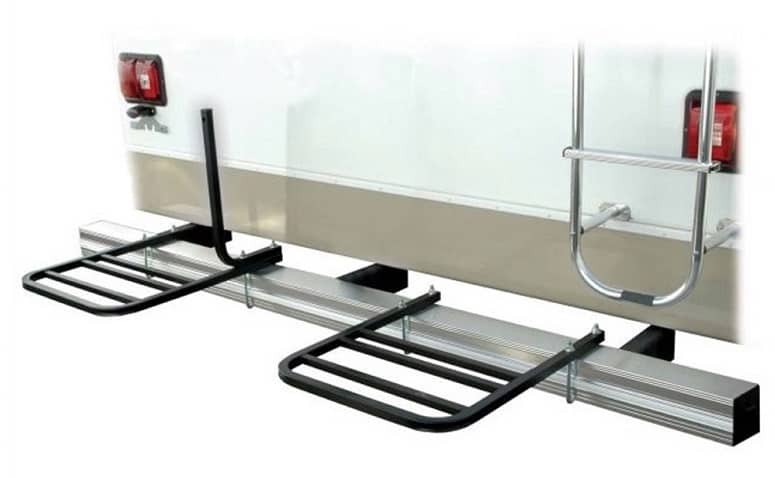 We wanted to cover how to install both RV bike rack types that we included on this list. Keep in mind that some methods might require a DIY touch and/or knowledge of welding with the proper tools. While these are the easiest to install, you can’t simply hang them on the ladder and call it a day. There is a lot more stress on ladder racks, since your bikes will have to hang vertically. If you didn’t get a perfect fitting ladder rack, you’ll need to either screw in additional brackets, or weld the rack to your ladder. Assembling any ladder rack is very simple. One of the most common options is to weld a receiver onto the bumper. However, your bike rack might not be rated to last forever, and this is a more permanent fiX. We don’t recommend welding in this case. Instead, you’ll want to screw in the adapter for the bumper that came with your purchase. If you didn’t receive one, you’ll have to make an additional purchase. Your adapter will rest on the top and bottom of your continuous steel-welded bumper. Most adapters are not fitted for anything besides continuous steel-welded bumpers, so be certain to check with the product details prior to purchase. Simply attach the screws and nuts, essentially locking the bracket in over your bumper, ensure it’s tight, and you’re good to go. The rest of the unit slides into place with a single bolt to secure it. Your bike rack will come with mounting straps built into the pegs, but that isn’t enough. For peace of mind and expecting the unexpected, it’s best to take additional measures. You can purchase nylon straps with high weight capacities (usually 200 lbs of pressure or more), or bungee cables, and run them through the spokes of your wheels to secure them to the metal beneath your bumper. This works especially well if you have a hanging bike rack. Nothing makes drivers behind you uneasy like a spinning bicycle wheel or a a wobbling rack. In any event, using straps or bungee cables can help to reduce the strain on your bike rack if you’re within 90% of the maximum weight capacity. Other methods are more invasive and usually custom. Securing your rack and ensuring it’s rattle-free is the foundation, otherwise your bicycle won’t have anything stable to hold onto. It depends on the weight limit and how many slots are available. We would like to stress the fact that just because there are four slots available on a rack, it doesn’t mean you should utilize them all. Pay attention to the maximum weight limit allowed. Exceeding that limit and hitting high speeds while travelling could cause enough rattling to snap the bike rack, or at the very least bend it. The rack comes closer to the ground, scrapes against the asphalt, and you can damage your bikes. If you are transporting all adult-sized bikes, we recommend getting a four-bike rack and storing no more than three on it. Folding bikes were one of the biggest trends of 2014. Companies started making bicycles that can fold up into a backpack, and if you’re planning on using one, you might not need an RV bike rack. You could either use the DIY method we mentioned earlier, or you could simply store it in your RV while driving. Folding bicycles should be mounted somewhere safely with a bungee cable or a mounting bracket, even when inside the RV. They’re generally built of a very lightweight construction, so another option is to keep them folded open and mount them on a bumper rack. If your entire family is using folding bicycles, this could be the most efficient storage method so you don’t have four hunks of aluminum taking up space indoors. The weight is a major factor, but also the wheel size. When you buy a bicycle, the wheel size is often what dictates the frame size, and the overall length. If you’re using a bumper rack, you should have no problems (outside the parameters of what the rack will allow), but with ladder racks you have to keep the size in mind when mounting. This is one of the most defining factors: just how many bikes can it store? Most racks will state in their description “one or two,” which you need to be wary of. Look at the weight capacity to help determine if this is a right fit for your RV. If you’re thinking about a ladder rack, take the dimensions into account with your RV, how far the ladder is from the corner, and how much your bikes will stick out. This refers to how easy it is to mount, versus how effective that mount really is. You want a bit of adjustability to work with, so loading and unloading your bikes doesn’t become a chore. Straps that hold the bike down, as well as the closeness of the rack to your rear window, should both be taken into account during the purchase process. All bicycles are made different, and can give you out of the ordinary problems that you might not be expecting. For instance, if you get a Wayfarer-style bicycle (broad handles, like old beach cruisers), then you might have them bump into the window on the back. It mostly comes down to the style of the bike, and its size. We discuss an issue with one of the bike racks we selected, which faces this problem. If you’re transporting all adult bikes, most four-bike racks aren’t going to hold them all. Depending on wheel size, design and the weight of the bikes, you might run into problems. Most adult Schwinn bikes come at around 37-43 lbs, and most bike racks will hold a maximum of 35 lbs on either bicycle mount. The problem becomes needing a separate, one-off bike rack to store the adult-sized bike, while the children and teenager-sized bikes remain on the primary rack. It takes a bit of logistics, just pay attention to the weight of your bikes before making your purchase.